Bryan Kest has been practicing yoga since 1979 and has been teaching since 1985. He developed his unique, distinctive style of yoga, Original Power Yoga, in the late 1980s. Over the years, this style, an amazing workout for the body, mind and spirit, has made him a well-known, popular teacher across the United States and around the world. 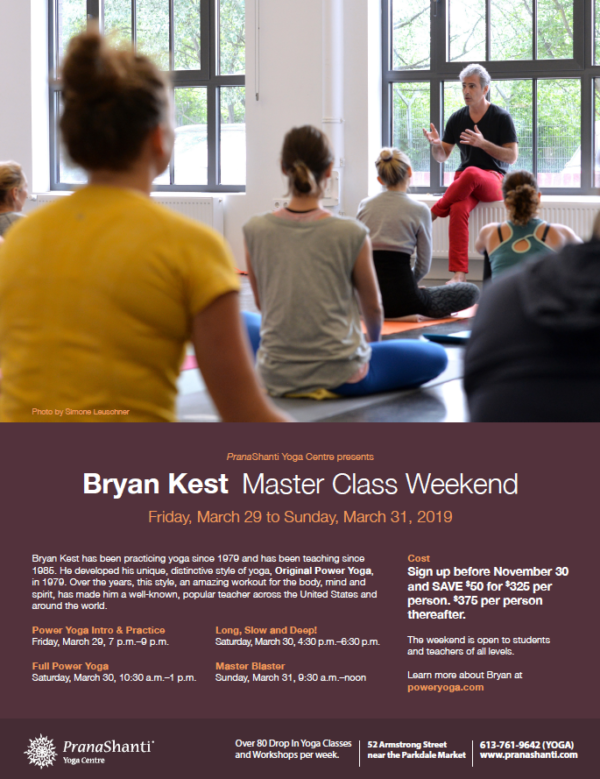 Bringing yoga back into yoga this is the class that most likely will inform your yoga practice the most as Bryan explains how yoga is not a physical practice but a meditation practice and how this relates to anything we do including exercise — Power Yoga intro and practice. Full Power Yoga flow with all the bells and whistles. In this class we put meditation into motion in a very full physical experience. LSD, which means Long, Slow and Deep! Here we compliment the masculine with the feminine and the strong morning flow with something very deep! Yin yoga on steroids. “Master Blaster”, a complete Power Yoga flow with meditation! This class touches it all. Strong, deep, with meditation! $375.00 per person for the weekend of seminars (1 on Friday, 2 on Saturday and 1 on Sunday), or sign up for individual sessions. The weekend is open to students and teachers of ALL levels. Bryan Kest has been practicing yoga since 1979 and has been teaching since 1985. He developed his unique, distinctive style of yoga, Original Power Yoga, in 1979. Over the years, this style, an amazing workout for the body, mind and spirit, has made him a well-known, popular teacher across the country and around the world. His mainstream popularity is matched by an authentic foundation in the ancient practice of yoga and a long path of development as a yogi (a practitioner of yoga). At age 15, Bryan uprooted from his native Detroit home to make a life change in Hawaii. He moved to live with his father, a doctor, who understood the benefits of yoga. Like many of us, Bryan originally thought yoga was nothing more than strange contortions, but that changed when his father introduced him to a physical style of yoga called Ashtanga. This appealed to him immediately, and he soon observed great changes in himself, both physically and mentally. Yoga quickly became his passion, one that would take him to India for a year to study with the great yoga masters of the world, Pattabhi Jois. He has been continuing on his yoga path ever since.